Whether your booking request is via one of the many Ashburton accommodation websites or directly The Green Gecko will receive your Ashburton accommodation request. We at “The Green Gecko” will check your booking request. If available your accommodation booking will be processed. We will request your full name, residential address, contact phone number and credit card details. Once we have received your details we will complete an invoice with our bank account details. This will be returned to you outlining your details, dates of your stay and total cost and required deposit. Check the details and either contact us again to correct or confirm the details are correct and pay the deposit. A non-refundable 50% deposit is required to secure your deposit. Payment is either by internet banking, Credit Card payment or by cash on arrival. You will forfeit your deposit if you cancel your booking. Only after we have received your deposit is your booking confirmed. Should your booking be rejected due to unavailability or other reasons we will advise you. There is always a possibility that someone may book prior to you. 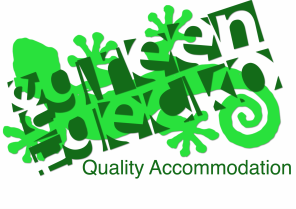 “The Green Gecko” takes accommodation bookings on a "first come, first served" basis. If you need accommodation in Ashburton immediately or within the next few days we suggest that you contact us directly by phone 0800 GRN GKO (0800 476 456) to avoid disappointment. We reserve the right to turn away any prospective guest and are not required to offer any reason for doing so. The Green Gecko holiday home is fully furnished. Duvets and pillows are provided for the beds plus extra blankets. Tea towels and dishcloth are supplied. Personal hygiene products including soap, shampoo, hairdryers etc Laundry powder. A simple gas barbeque is available at The Green Gecko. You will need to bring your own gas bottle or we can hire one out to your for $5 per night. Delivery can be arranged. Any BBQ used by a tenant is required to be cleaned properly prior to departure. BBQs are inspected after every tenant and if you fail to clean the BBQ after using it, you will be charged a $30 cleaning fee. We clean all properties after guests leave. The Green Gecko has two dwellings the house which sleeps up to 6 and the apartment provides beds for 5 guests. Meg's Place, another 3 bedroom home sleeps 6 guests is only 100 metres away from the Gecko house. Guest numbers are not not exceed the set maximum number. Pitching tents is not permitted unless otherwise agreed upon. Minimum night limitations may apply to event weekends, long weekends due to Statutory Holidays, or school holiday periods. As a general rule Ashburton holiday home guests are asked not to check in to The Green Gecko any earlier than 2pm on the day of arrival. Contact us if your plans require you to book in any earlier and we may be able to accommodate your request. Check-out time from your Ashburton holiday home is 10am. Late check out may only be possible at our discretion. You will need to discuss this with us prior to your arrival. A non-refundable deposit of 50% of the total cost of accommodation is required to secure your booking. This will be deducted from your account. The remaining tariff is to be paid in full two weeks (14 days) before your arrival. A booking confirmation will be forwarded to you upon confirmation of availability and receipt of payment. You may pay your deposit by direct deposit or cheque. We will send you our bank account details when you make your reservation request. Deposit payment is required to confirm of a reservation request. The Green Gecko reserve the right to rebook a home should this not be paid on time. Should you require extra time or wish to cancel a booking please contact us immediately. If a booking is made within 14 days of the expected arrival date then the full amount of the booking will be required within 48 hours. During your holiday stay with the Green Gecko holiday home it is your responsibility to remove all rubbish before your departure. Rubbish and recycling is collected every Wednesday from 7am onwards. Please place all recyclable items (plastic bottles, paper, cardboard & aluminium cans) into the green recycling bin placed at the back of the house. All other house hold rubbish is to be placed in an official “Ashburton” rubbish bag. These cost $10 for 5 bags and can be purchased from the Allenton Four Square Foodmarket. Rubbish bags that aren’t the official Ashburton rubbish bags will not be collected. Any rubbish left in the Green Gecko holiday home found after your stay will be removed at your cost. We do not allow any pets at The Green Gecko. Should we find animal hair or odour inside the premise at the time of inspecting the home the tenant will be liable for any costs associated in remedial work required. The tenant is also liable for any damage caused by pets in the property during their stay. Smoking is prohibited in The Green Gecko home, flat and Meg's Place holiday home. If guests create unwanted odours in the house during their stay we reserve the right to have the house cleaned including but limited to dry cleaning drapes and fittings in an effort to remove unwanted odours at the guests expense. A telephone is provided. The number is 03 975 8143. All tolls are blocked on this number. Ashburton has excellent cell phone coverage. Guests at either The Green Gecko Holiday Home or Flat or Meg's Place Holiday Home are liable for damages to any of oue properties or contents of these properties incurred during their stay. It is your responsibility to inspect the property and report any damage immediately to us upon arrival. The Ashburton holiday home guest will be required to sign a form upon arrival that states they accept full responsibility for any charges for the holiday home during their stay. It will also acknowledge that the Ashburton holiday home guest is personally liable for payment for any damage to the Ashburton holiday home or property both malicious or accidental by themselves or any of their holiday home guests and that any remaining balance can be charged on their credit card or invoiced directly to them should a credit card not be provided. Should Ashburton holiday home guests lose any house keys then the holiday home guests will be held responsible for the replacement costs of the keys and may also be held liable for the costs of replacing locks if deemed necessary. We have a zero tolerance policy in regard to noise. Noisy parties or gatherings are not permitted. We ask that you respect the neighbours. If complaints are received and we are required to attend the incident a $50 call out fee will be charged and you risk being evicted from the Ashburton holiday home. Large gatherings for birthdays, weddings, conferences or similar such activities, where the number of people in attendance at any one time far exceeds the stated number the house sleeps, must first be approved by The Green Gecko owners. While every care will be taken to retrieve lost items we will not be held accountable or responsible for items lost or left behind by tenants. We reserve the right to charge a collecting fee for any items left behind by the tenant. Items will be held for a period of three months before being disposed of. Ashburton Accommodation - The Green Gecko, Canterbury, NZ.